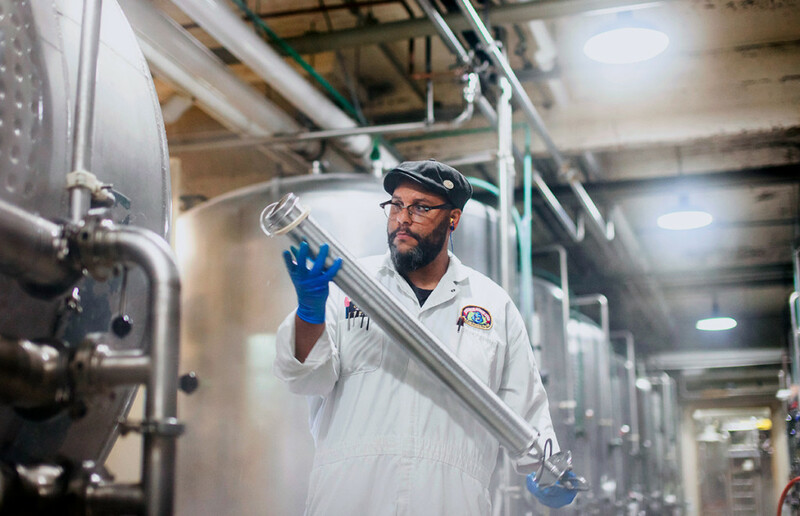 If you’ve been following our Stewards of Steam weekly blog series, you’ve noticed by now that Anchor Brewing is dedicated to continuing to make handcrafted beer in San Francisco and to remain a pioneer in American Craft Beer. The Stewards of Steam are the people who work at Anchor and make this possible. 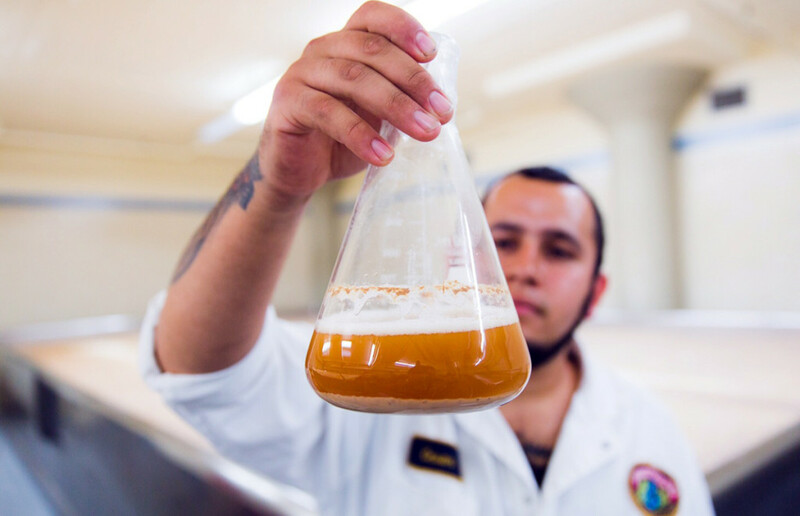 We are proud of the work we do every day to keep our traditional brewing methods alive and in San Francisco. We love what we do and we enjoy giving it our all to create beer that our fans and craft beer enthusiasts can enjoy. Maintaining our role as a pioneer in American Craft Beer means we focus a lot on new beer development. Our brewing heritage gives us a solid foundation from which we can continue to evolve and experiment. We keep our traditional brewing methods alive while continuing to innovate and push the boundaries of our craft. Sure, we pay attention to current trends in craft beer, but we’re also proactively working to predict new trends and create beers that reflect those discoveries and inspiration. “I am Kate. I am the New Beer Development Manager, and I’ve worked at Anchor for three and a half years. The majority of the beer Anchor brews undergoes two fermentation cycles. First, cooled wort from the brewhouse is transferred into open vessels; the ales into square, deep vats and the lagers into wide, shallow “coolship” vats. The yeast is pitched into the wort and fermentation takes place, producing ethanol and carbon dioxide. Following this primary fermentation, the beer is transferred to our cellar room, located 12 feet below the streets of San Francisco, and put into closed fermentation tanks for its secondary fermentation, maturing and naturally carbonating in cold, pressurized tanks. If we want the beer to have extra hop aroma we will dry-hop in these tanks by adding mesh sacks of hops and/or using a custom vessel that continually filters the beer through a chamber of hops, amplifying the dynamic hop bouquet. This entire process takes roughly 2-3 weeks for ales and 4-6 weeks for lagers. “I am Cesar. I work in the Fermentation Department, and I have worked at Anchor for five years. Once the beer is done fermenting in the cellar it is sent to our filtering room. Here the beer is run through a centrifuge and then filtered, removing any sediment. Our filtration system works at 50 gallons per minute! The beer is then flash pasteurized to ensure it stays fresh on its voyage to numerous countries, all 50 states, and the Anchor Taproom! 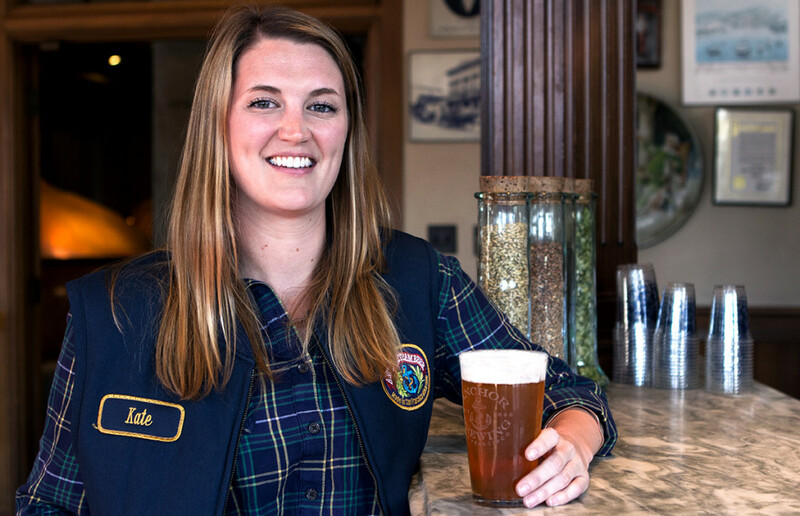 Next time you grab a pint or six-pack of Anchor, #RaiseYourAnchor to Kate, Cesar, John, and the rest of our #StewardsofSteam for their hard work behind the scenes.